"Society of Friends - Spicewood Church. -- This congregation held its first meeting at a house on the land now owned by Elijah Jay, one-half mile west of Spicewood, in November, 1865. The preparative meeting for business was held July 26, 1866, in a log cabin on the land of Amos Cook, one-half mile south of Spicewood. Jesse Mills, Elijah Jay, Patty Furnas and Lydia Ann Cook constituted the committee then appointed. Christopher Spray and Eunice Furnas were the first permanent Clerks, and Samuel W Cook the first Treasurer. "Jesse Mills, son of William and Elizabeth Mills, was born, in Warren County, Ohio, on the 27th day of 2nd Month, 1831. He was a birthright member of the Friends Church and was converted to God early in early in life. He was married to Mary Jay in his 19th year, which proved a happy union, lasting nearly fifty-four years. 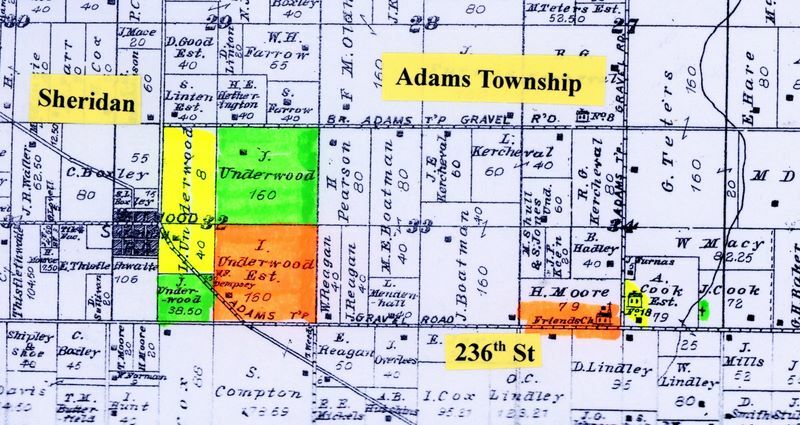 With his wife and two daughters he removed to Hamilton County, Indiana, in the spring of 1865, becoming a member of Greenwood Monthly Meeting in the limits of Westfield Quarterly Meeting. Physical location: SHERIDAN 46069, 2 MI. E, ADAMS TWP. Before and After: PM 1866 UNDER GREENWOOD MM. ATTACHED TO WEST GROVE MM. S6 Book: Minutes of Western Yearly Meeting of Friends. Westfield, Indiana: Society of Friends, Western Yearly Meeting, 1900. Bk3559.